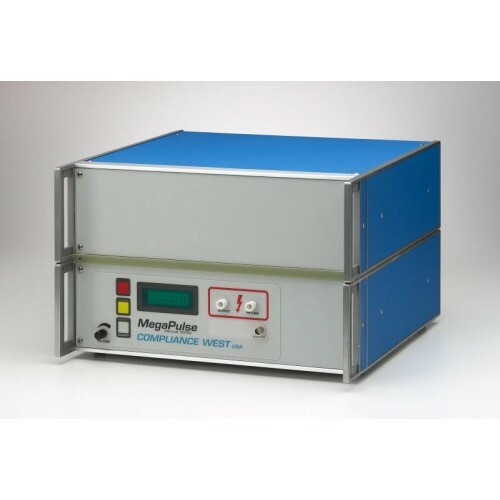 MegaPulse 1.2x50-12.3PF 500 ohm, 400-12.3kV, 3 sec charge time, 500 ohm virtual impedance; internal charge capacitor (bulk cap) can be charged to 12k.3V 0.5 Joules. In accordance with the requirements in IEC 62052-11 Section 7.3.2; and other Standards by reference. It is acceptable for testing to the requirements of IEC 62052-11 Section 7.3. This tester is in accordance with the measurement requirements of CTL DSH 251E. Power supply will deliver a pulse derived from a capacitor charged to 12.3kV with energy of 0.5J. Optionally other voltages can be selected for a 0.5J delivery as well. The extremely small energy and very high voltages have shown transients in the tail of the pulse delivery duration graph, at voltages less than 50% of the peak output. Because the output is "clean" from the peak to the 50% voltage level, the duration of the waveform is easily measured and calculated; these transients have no effect on the calculation. This is due to the arc between the relay contacts extinguishing before the entire waveform has been delivered. Please see our white paper "Impulse Testing Waveforms and Relay Performance" for further details and waveform examples. This behavior is only manifest at 12kV. Lower voltage waveforms do not exhibit this transient. The meter shows the peak of the output waveform into an open circuit. Pulse delivery one per 10 seconds. For automated pulse delivery, please order Option TMM-PF, TestMinder MegaPulse PF. Built to the requirements of IEC 62052-11, Section 7.3.2, Impulse Voltage Test. Generates the waveforms described in EN62052-11, Paragraph 7.3.2 for testing Metering Equipment. Theoretical graphs and actual graphs showing the output of your tester are included with each MegaPulse. Reverse polarity waveforms available by pushing a button on the front panel. No need to change the test setup. Positive polarity indication minimizes errors. Front panel voltage meter shows residual voltage in charging circuit for safer operation. Ships with cables, graphs of theoretical and actual waveforms. Calibration Certificate to ANSI Z540. A2LA Calibration Optional. For Specifications, please see Datasheet Link, above.